Critical dimensions to mastering inventory, including understanding product characteristics/lifecycle, business model, risk, and more. How much inventory and which items should a company hold, overall and at each stocking location (each DC, store, stockroom, salesperson’s vehicle, service depot, etc.)? When to replenish and how many? To the uninitiated, these seem like relatively straightforward daily decisions. But they are anything but simple and can make the difference between a highly profitable vs. out-of-business company. This article is derived from a recent webinar by the same title, Dimensions of Inventory Management: Holistic Strategies for a Volatile World, which you can play back by clicking here. In most companies, there is a tug-of-war between the different forces and functions and third parties that have a role in decisions and execution regarding what inventory to carry where. Each has a different perspective. A classic example is sales chronically over-forecasting (because they are rewarded for revenue, not forecast accuracy) and then manufacturing creating their own forecast, because they never trust the sales forecast. 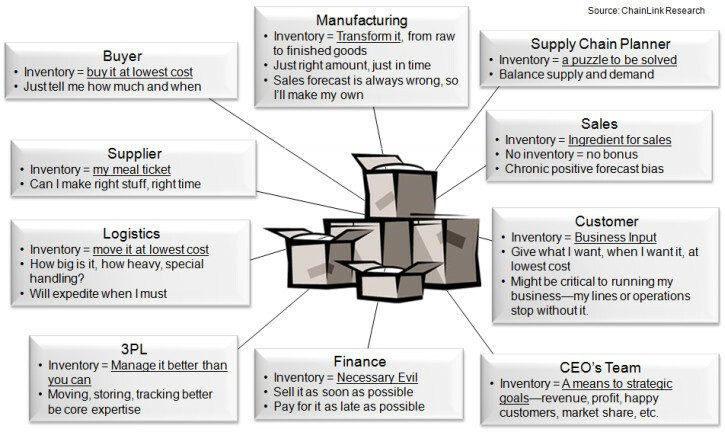 The characteristics and optimization objectives of a company’s industry segment have a big influence on inventory policy (see Figure 2 below). 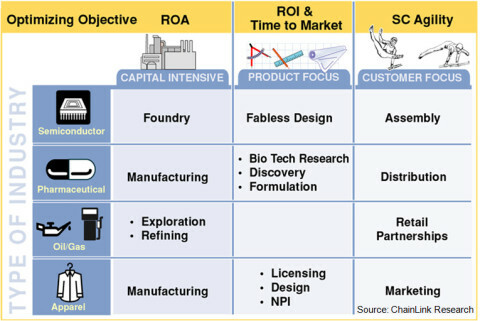 A capital intensive firm, such as a semiconductor foundry, where each fab1 costs anywhere from $2B to $5B to build, has their whole focus on achieving a good ROA (Return-on-Asset). Factory utilization is a critical metric for them—keep those billion dollar lines running! Contrast that with a product-focused design firm, like a fabless semiconductor company. They are a bunch of engineers that design chips. They don’t own any plants and their focus is time-to-market with a differentiated product. Other firms have a supply chain agility objective: postpone differentiation until the last moment, when demand is more accurately known. Thus the over-riding optimization objective of the firm informs their inventory strategy (and many other aspects of their operation). A key aspect of a business model is who owns the inventory—i.e. when does title change hands as goods flow through the supply chain, and who makes the stocking and replenishment decisions. Ideally this is based on whatever creates the best outcome for the supply chain. For example, a manufacturer has knowledge of casual factors impacting demand of their product2 whereas the retailer has the actual demand/purchase data in their POS system and understands the broader promotions going on in their stores. Ideally they will collaborate together to make the best planning and replenishment decisions. Then there is the question of inventory ownership. In traditional business models, the manufacturer or retailer owns the safety/buffer stock in their factory, or DC, or store, and makes the replenishment decisions. 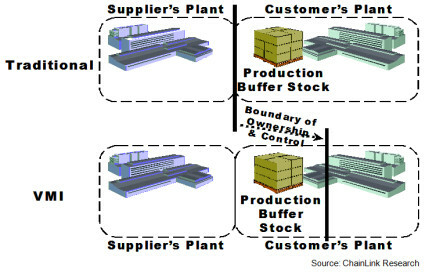 In VMI and similar business models, the supplier typically owns the safety stock and makes those decisions (see Figure 3). This places additional burdens on the supplier, as they are now carrying the inventory longer, and that inventory is spread out across many different customer locations, rather than only in the central pool of inventory within their DC. In theory, when the supplier ‘feels the pain’ of this inventory and has better visibility into actual demand, they will do a better job in planning their own production. However this requires that they have the systems and expertise; a different set of forecasting and inventory management skills. Often, especially when the customer is large and powerful, these decisions about inventory ownership and control are mandated by the customer. We did in-depth research into the high tech industry’s transition to a VMI model, that revealed much about this aspect of a firm’s business model (see The Truth About VMI: Revelations and Recommendations). Human relationships (person-to-person)—the foundation for collaboration and information sharing. Process relationships (workflows, formal and informal decision processes, system-to-system)—these should be re-examined on a regular basis. “We’ve always done it that way” prevents badly needed improvements. Contractual relationships—the purpose of the contract is to encapsulate the rules of the relationship, in a flexible way, that generates well-understood, deliberate commitments from both sides. The characteristics of the product being sold make a huge impact on inventory strategy. 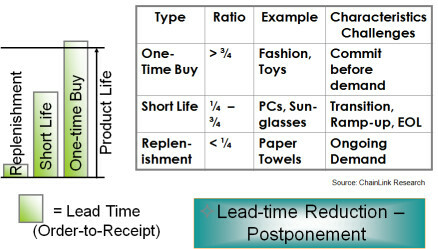 For example, postponement, or differed differentiation, can be used to create more effective inventory management. 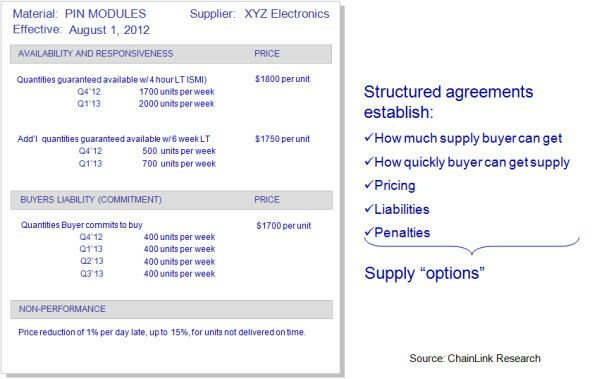 One form of this is build-to-order of a configurable product. Many different SKUs share pools of common components, which are not assembled until you have a firm order for a specific SKU in hand. It is much easier to forecast aggregate demand across all of those SKUs. By pooling common components, a manufacturer can hold less inventory (while achieving higher service levels) than if they built out each unique configuration ahead of time, before receiving orders. However, this type of configurability—the ability to actually differ the differentiation—must be designed into the product. So, the supply chain group may brainstorm with the engineering group on ways to achieve differed differentiation. In this case, the product’s design characteristics are being specified with the explicit goal to support more effective inventory management. Another example of product characteristics is seeing where each product fits on the ‘Uniqueness-Commodity Spectrum.’ On one end of the spectrum, a retailer of high fashion items may create exclusivity and uniqueness by carrying only one of each size of a particular dress. It would be ridiculous to do that with a highly commoditized article, such as paper towels. In the latter case, you never want to run out of stock, or else the customer will buy another brand (bad for the manufacturer) or, if they are brand loyal, will go to another store (bad for the retailer). 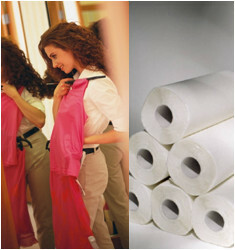 Thus the characteristic of the product and the market must be considered in any inventory strategy. Replenishment decisions must also take into account risks—such as what are the consequences of an out-of-stock, and what is the level of inherent risk in the supply network. The consequences of an out-of-stock may vary dramatically. Consider two items with the same lead time and demand variability—standard formulas may tell you to keep similar levels of safety stock. But, suppose running out of one item means you simply have to juggle some production schedules until it arrives, whereas running out of another item shuts down your entire production line, costing millions per day. Obviously that must be considered when deciding how much of each item to carry. In addition, one item may have alternate sources available or a highly reliable source, whereas the other has only a single source, and that supplier has many vulnerabilities (these could be the financial, geo-political, natural disaster risks, etc.). This risk information also should be incorporated into inventory decisions. Often risk management is considered a separate discipline and organization from inventory management, but in fact the two should be working together closely. Beyond visibility, of course technology can help tremendously with forecast accuracy and replenishment decisions. But these replenishment formulas are only as good as the input data. For example, it takes work to find out the real lead times for all your items. People will often take a short cut and enter the same lead time for all items (or all of a class of items), resulting in incorrect replenishment calculations and decisions by the system’s algorithm. No matter how great the replenishment algorithm and technology are, they will give wrong answers if the input data is wrong. Each organization has a set of strategic goals. Ideally the whole organization, including inventory management, is aligned to meet those goals. 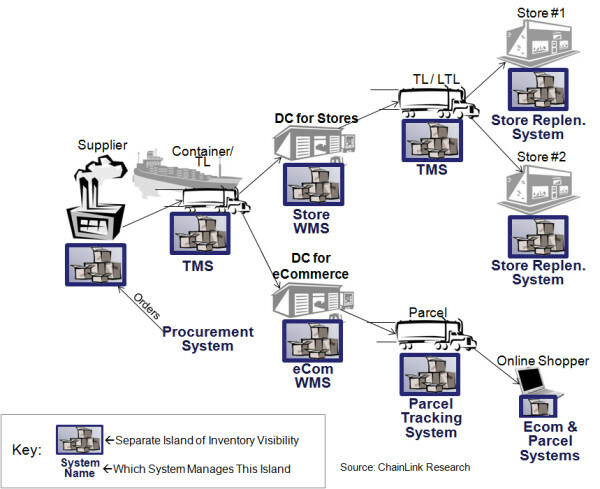 However, many parties influence a company’s inventory strategy (remember the tug-of-war depicted in Figure 1 - Inventory's Multiple Personalities) and the metrics and compensation incentives for those various parties are not always aligned to the strategic goals. Those metrics and incentives should be reviewed on a regular basis to understand the underlying causes that create behaviors that may be counter-productive to achieving the goals. For example, perhaps a portion of the salesperson’s bonus should be based on forecast accuracy and/or profitability of the sale, instead of solely on revenue generation. The drivers of inventory policy and strategy are dynamic. Successful companies are constantly reassessing yesterday’s policies and decisions to see if they still make sense today—everything from replenishment algorithms to competitive dynamics to changing product characteristics. Further, they are able to bring together all of the intelligence across the organization to make smarter decisions. They align individual metrics to the strategic goals. They have flexible supplier arrangements to more successfully accommodate both downside and upside demand scenarios that materialize. They have end-to-end visibility into their inventory, across the chain. They incorporate risk management into their inventory strategy. In short, they take a holistic approach to more successfully manage their inventory.